Whether you’re a parent or a busy professional, our hustle and bustle lifestyles inevitably result in more and more time behind the wheel. 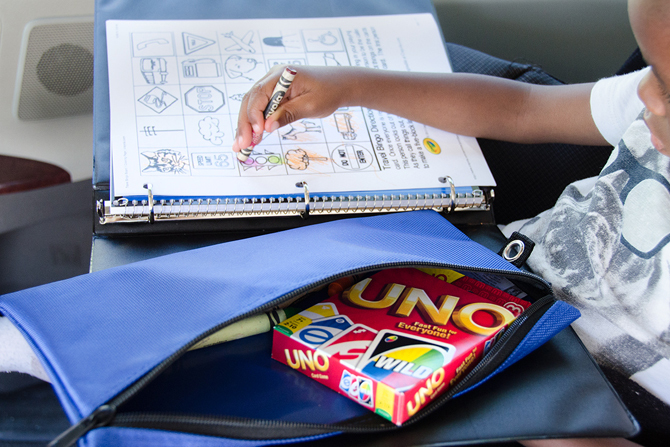 From school runs to grocery shopping, to work commutes, to the myriad of other chaperoning commitments that you don’t even recall agreeing to — chaotic car trips are an unavoidable reality for all parents. 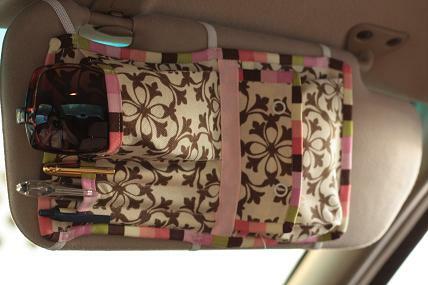 Keeping your car tidy often seems impossible, but the right trunk organizer can change that. So, to help you out, we’ve put together a list of what we consider to be the best trunk organizers on the market right now to help you find one best suited to your needs. Picking the best overall trunk organizer was no easy task, but after hours of research, I managed to settle on one. And that product is the tremendously tough and versatile TrunkCratePro TC-PRO02, standing head and shoulders above its competitors. This Hand Crafted, Eco-Friendly Trunk Organizer is jam-packed with a host of phenomenal features that will make keeping your car clutter free easier than it has ever been. The first thing that makes this nifty organizer my personal pick for the top spot is its clever layout that you can easily adjust the size and number of compartments to tailor suit your requirements (you can change between two, three, or four compartments). 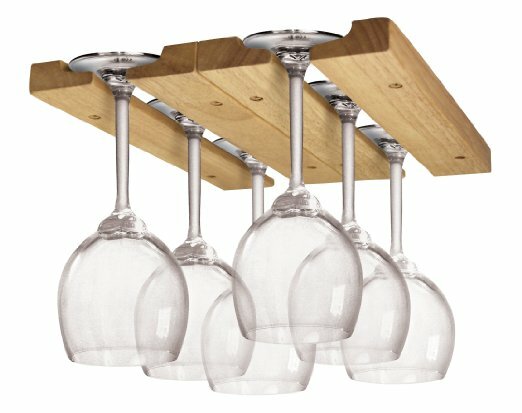 It has several handy bottle compartments to help you keep your valuable wine, I mean water, safely out of harm’s way, and it conveniently doubles up as a seat organizer when reduced to half-length. On the rare occasion you decide you don’t need the services of the TrunkCratePro, it can be conveniently collapsed and neatly tucked away in a draw until duty calls again. 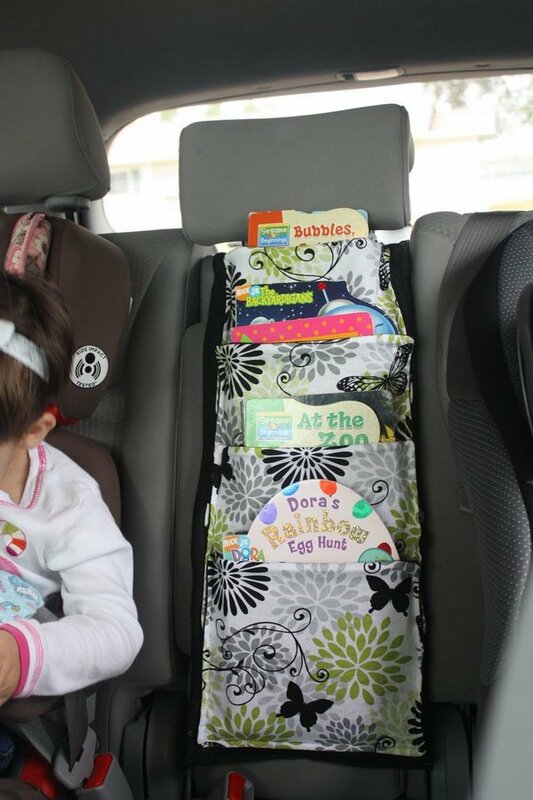 Another feature that makes this product the Ultimate Trunk Organizer is its “Exclusive Non-Skid Velcro” underside that prevents pandemonium from unfolding by ensuring your cargo stays stock-still while you travel. 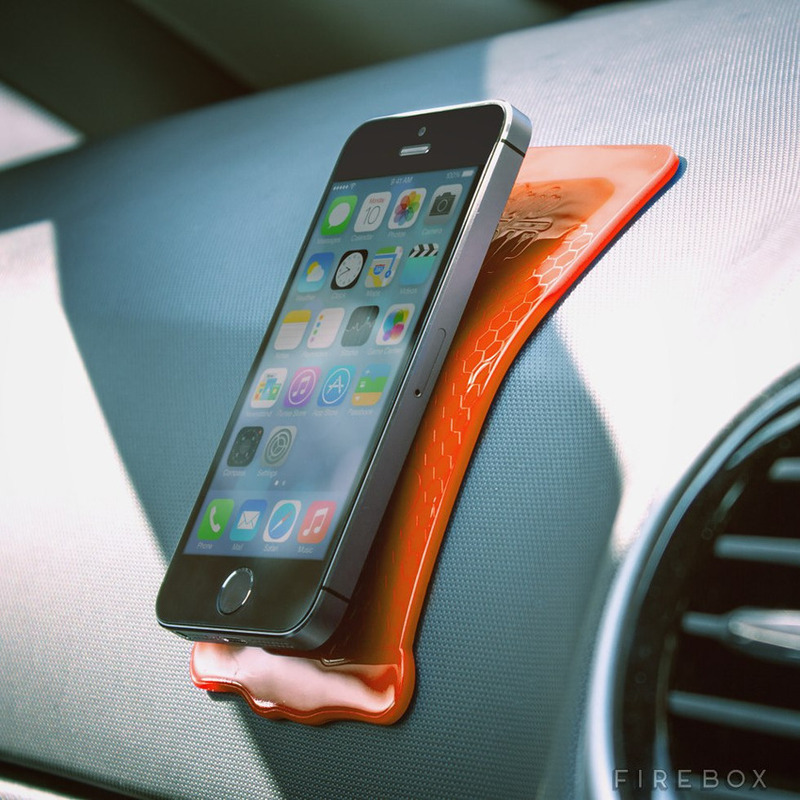 In terms of durability, this product is remarkably robust. Crafted using the highest-grade Oxford Polyester and finished off with reinforced stitching, the TrunkCratePro is waterproof, easy to clean, and able to withstand a lifetime of hard use. Literally. It actually comes with a Lifetime warranty. With cars being a whole lot smaller than SUV’s and trucks, they tend to get a lot more cluttered a lot quicker. Well, I have just the product to help you deal with the daily disorder that unfolds around you in your family car. The Drive Auto Products Car Trunk Storage Organizer. This aesthetically pleasing and intelligently designed Trunk Organizer ticks all the rights boxes in terms of functionality and durability, and it comes in at a remarkably reasonable price too. Nothing was left up to chance with regards to this Trunk Organizers resilient structure. Every panel, thirteen in total, has been soundly reinforced with rigid base plates to ensure it never loses its shape. 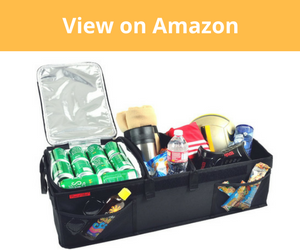 There is ample storage with three main compartments, two large front pouches, and an assortment of other specialized compartments for storing things like drinks or even document folders. Probably the biggest selling point for me must be the versatility that this product provides. 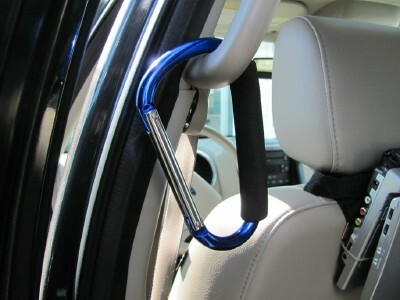 The sturdy strap tie downs that conveniently clip onto the hooks on the floor of your trunk, almost like a cargo net, also allow for the unit to be used in “front seat mode”, by snuggly wrapping around your passenger seat, locking it in place. 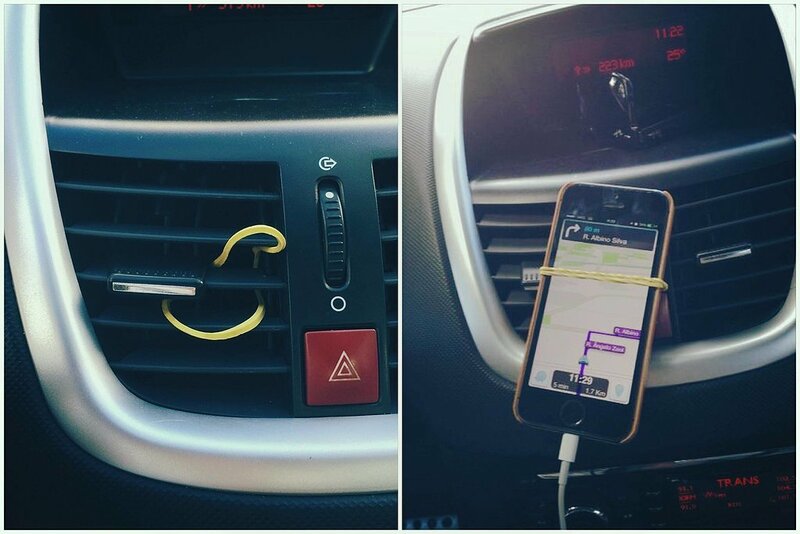 I don’t need to tell you how great it is to know your belongings won’t be unceremoniously hurled throughout your car every time you hit the brakes a bit too eagerly. The storage design and “front seat mode” option make this the perfect choice for parents who have to use their vehicle for family duties and work. 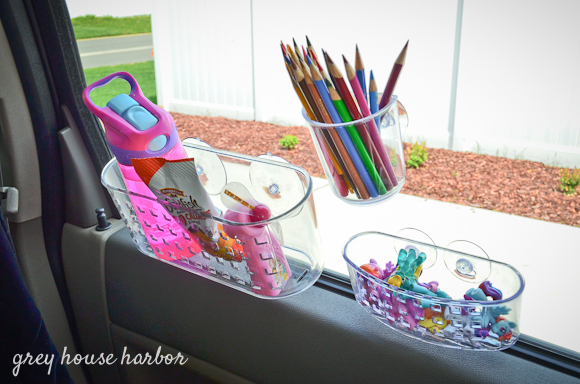 It can serve as a mobile office of sorts that can easily be moved from the trunk to the passenger seat after dropping the kids at school, and vice versa. If you drive an SUV you will probably be looking for a Trunk Organizer that can match the size and ruggedness of your vehicle, and that will not look out of place in your Trunk. In my opinion, this Trunk Organizer ticks all those boxes. Manufactured by Starling’s, a name that has become synonymous with both convenience and organization, this sturdy and spacious Trunk Organizer is perfect for all types of SUV’s, but that is not to say that it would be out of place in any other type of vehicle. What makes it such a great choice for SUVs is its ample storage, rugged design, and incredibly tough construction. 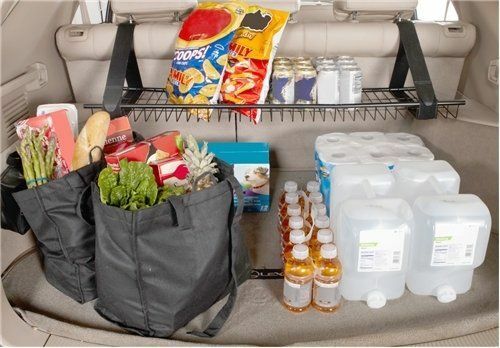 It expands up to two feet, providing more than enough storage for the average SUV owner, and it has several strategically placed compartments for storing just about anything you will come across when decluttering your vehicle. This product was built to endure exceptionally heavy usage, and is made from resilient, high-quality polyester, with additional stitching, and has a solid three-layer bottom board that is completely waterproof. The superior strength handles make is unbelievably easy to carry, and it can easily handle up to 100lbs in weight, which makes it ideal for use with more hard-wearing items, like tools or auto spares, that can often end up damaging lesser quality trunk organizers. There is nothing worse than arriving home to find that your groceries have been aimlessly hurled around the trunk on your car on the drive back from the store. 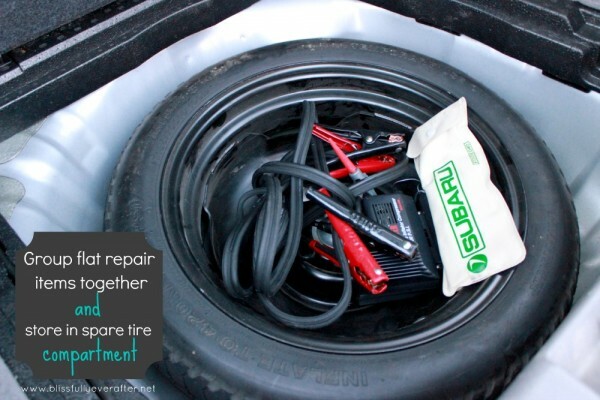 Thankfully FLAGPOWER Car Trunk Organizer can make this longstanding problem a thing of the past. 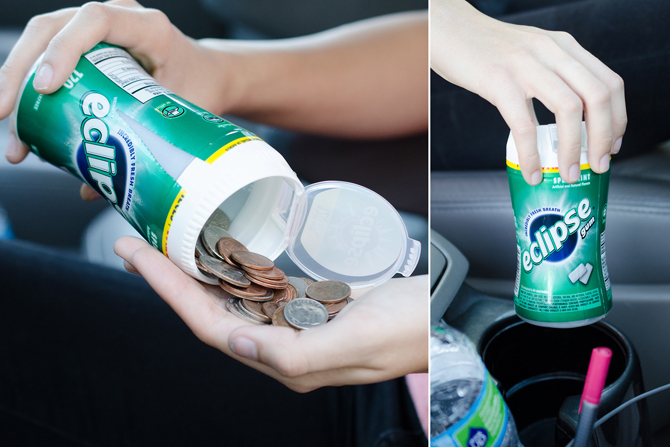 This fantastically versatile product is a must-have for all you frequent shoppers out there. 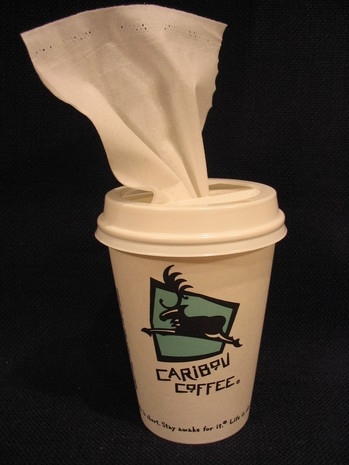 It even helps become more environmentally friendly as it reduces the need for disposal store bags thanks to its clever design that allows you to fold it up and comfortably carry with you as you shop. 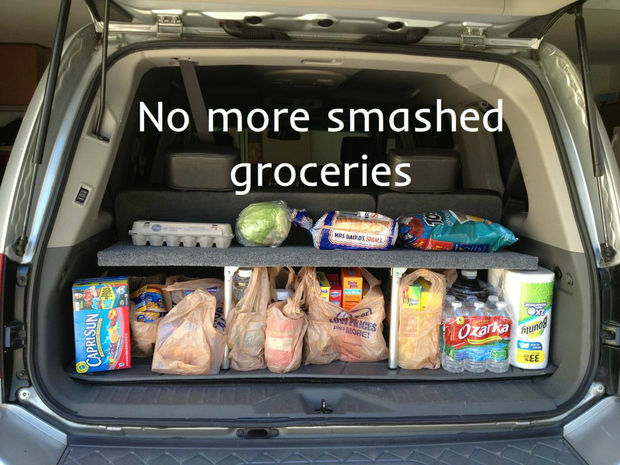 It is strong enough to happily handle up to 90lbs of groceries, so you won’t have to worry about losing your groceries on the way back to the car. 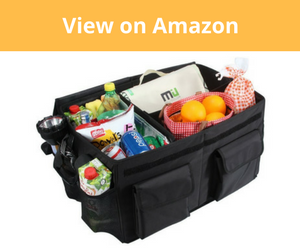 It has a solid, removable waterproof base, three large compartments, a removable subdivider, and rubberized bottom support to prevent your groceries from being roughhoused on the ride home. 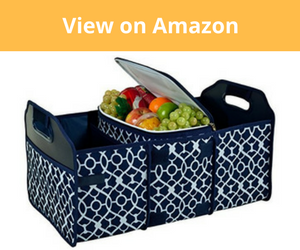 But just because this product is perfectly suited for shopping sessions and transporting your groceries, it does not mean it is not just as well-equipped for any other storage and organization requirements that arise on your travels. Made from durable polyester and thick PVC mesh, this product can withstand frequent and intense use without its shape or strength being compromised. 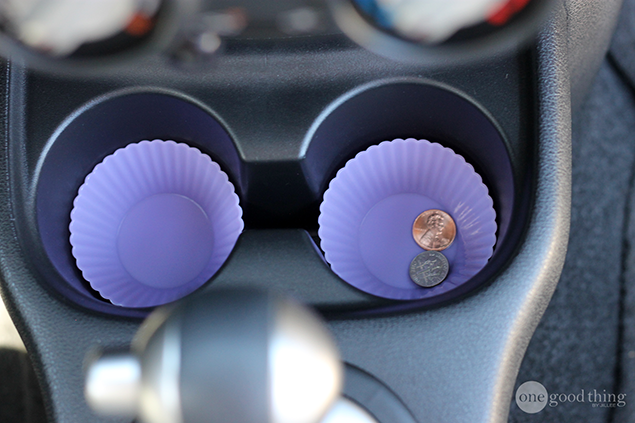 It is also great for smaller vehicles, as the “middle snaps” design means you can reduce it to half of the original size. And when not in use it can be neatly folded away for compact storage. Trunk Organizers are great. But, trunk organizers with reliable coolers built in are fantastic! And this version by Picnic at Ascot gets my pick as the Ultimate Car Trunk Organizer in this category. 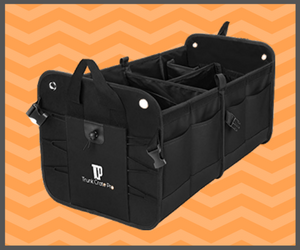 Built with “60 Denier Canvas” and reinforced with a waterproof backing, this terrific Trunk Organizer is about as tough as these products come. It can easily carry up to 100 cans, or 70lbs, and includes a thoroughly insulated 12- can capacity cooler that is heat-sealed, leak-proof, and resoundingly resistant to punctures. 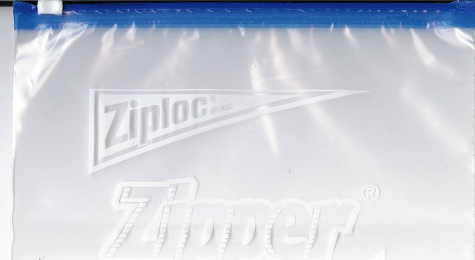 Its heavy-duty lining is “food safe” and will comfortably keep your drinks cold for up to 24 hours. 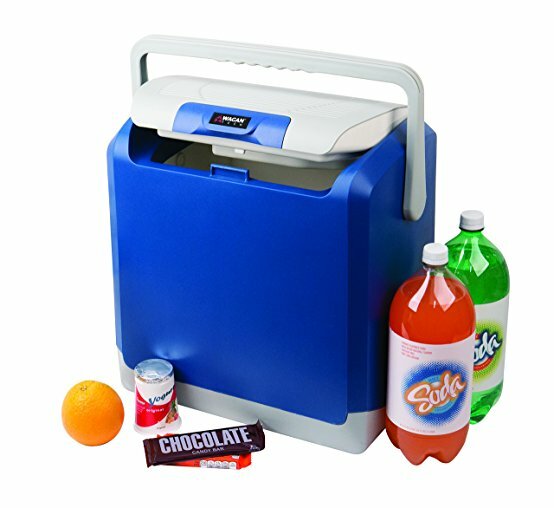 As if this wasn’t already impressive enough, this cooler is completely removable, so you can easily take your ice-cold items along with you to the beach or to watch the kids play sports. 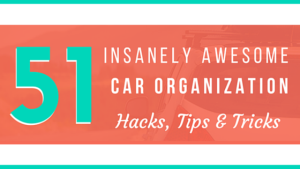 It also doesn’t prevent you from coming up with your own car trunk storage ideas, thanks to the adjustable dividers -there are three included – that can be attached anywhere you feel fit within in the organizer. This means It can accommodate the shape and size of almost anything you throw at it. Just maybe not the kitchen sink. But then again, I haven’t tried that yet. 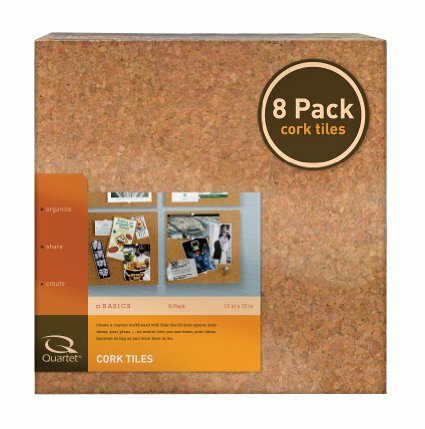 It is also decidedly durable, elegantly crafted using formidably reinforced Canvas and wonderfully waterproof backing making it a breeze to clean. The seriously strong yet surprisingly comfortable handles make it easy to carry even when fully loaded. 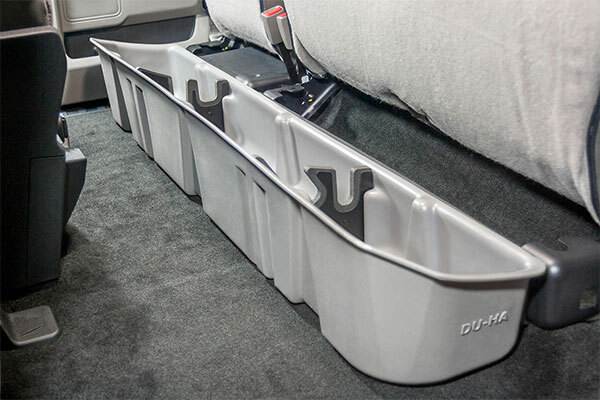 It also boasts a “non-skid base” that holds onto your trunk’s carpet really well, and it folds completely flat when you are done using it, making storage easy. It also comes with a Lifetime warranty, testimony to the confidence that Picnic at Ascot has in this product. There are hundreds of collapsible Trunk Organizers out there, but this foldable version by MIU COLOR is a particularly fine choice. MIU COLOR is a company built on three core values; Simplicity, Functionality, and Responsibility. 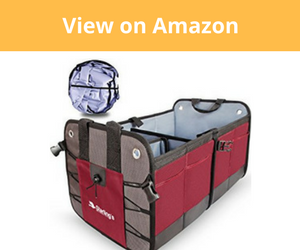 This foldable Cargo Trunk Organizer is a testament to these values. The forward-thinking design gives this product amazing versatility, with sturdy removable sub-dividers providing you with four different storage setups to cater to your specific requirements. 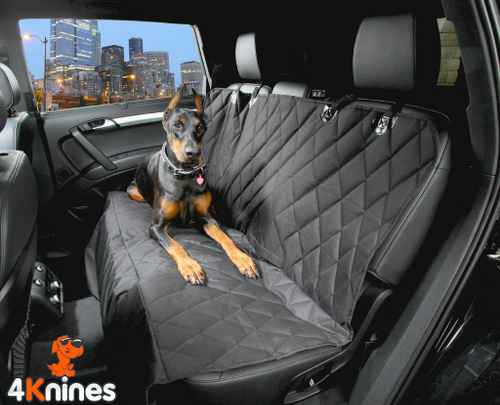 Made of highly durable polyester that is both abrasion and water resident, this product is washable making it easy to keep clean no matter how much battering it takes in the trunk of your vehicle. 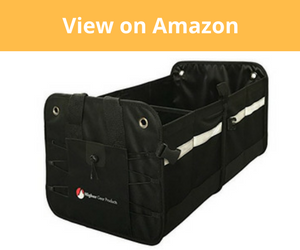 What makes it different to most collapsible Trunk Organizers is that it also comes with a removable cover that has Velcro strips to keep your goods protected from the elements. This is particularly helpful when you are moving things between the car and house in the rain. 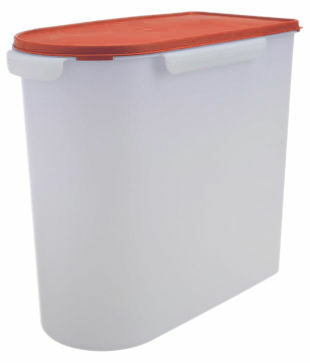 It reduces to 12.2 x 13.8 x 3 inches when folded flat, making carrying and storing about as easy as it could possibly be. It also currently comes with a great little cooler bag for keeping your drinks cold or your food piping hot, and it also comes with a complimentary water bottle, so be sure to order soon so you don’t miss out on this fantastic offer! 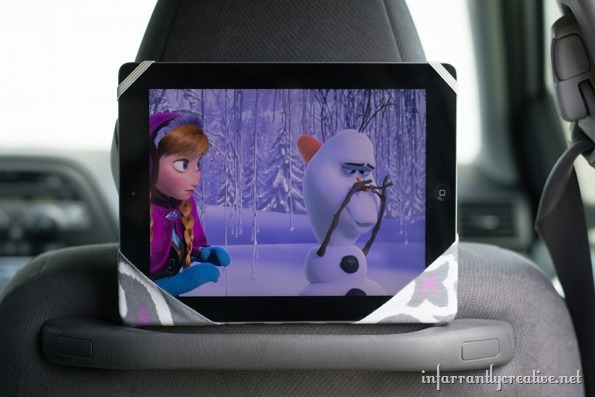 Velcro strips are provided on the underside of this nifty organizer to stop it from slipping and sliding all the show while you drive. 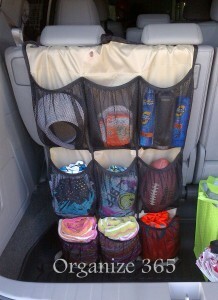 If you are looking for something a bit tougher than your average Trunk Organizer, then look no further. 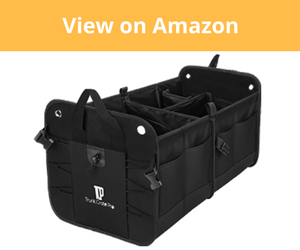 This Heavy-Duty Trunk Organizer can withstand anything your high paced family life can throw at it. Made from the most durable polyester available, it boasts fortified stitching and rugged handles, and you can tell straight away that this product was made to last. It has a waterproof base produced from high-quality rubber and nylon and has an “Anti-Sag” reinforced bottom that provides serious stability. 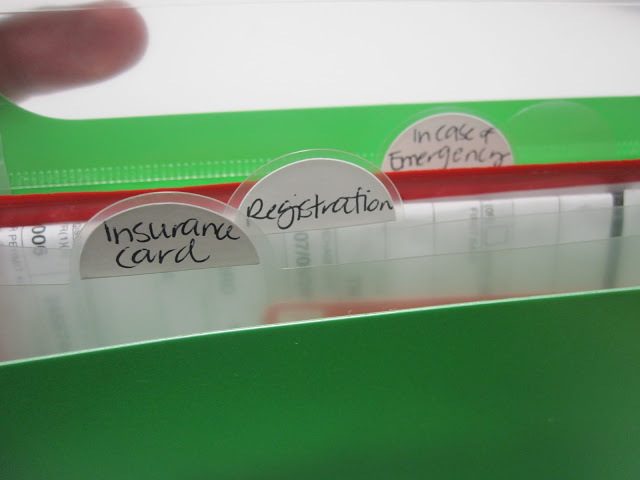 The impressively ridged sides ensure that this organizer remains perfectly upright even when the organizer is completely empty. Thanks to the inclusion of the “middle snaps” design you are given the choice of using just half of the unit when space is limited, and when it is not in use you can fold it flat for easy space-saving storage. 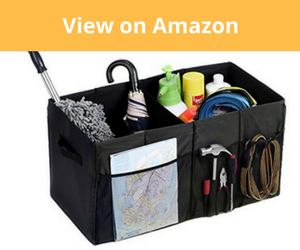 The rugged nature of this product means it can be used for storing just about anything, from jumper cables, motor oil, your kids’ sporting goods, cleaning products, you name it, this organizer can handle it. 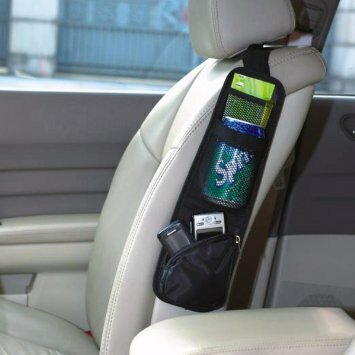 It has a unique reflective safety strip that runs the entire length of the organizer, so if you ever find yourself stuck on the side of the road at night in an emergency you can place this organizer next to your car for additional visibility. 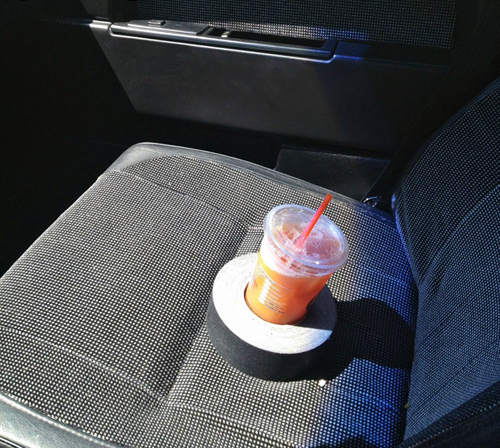 There are also hard-wearing rubber strips placed beneath it to prevent any unwanted movement while your car is in motion. Getting everything organized for a family outing to the beach, or down to the local park for a delightful picnic can be a daunting task. This gem of a trunk organizer will make things much smoother for you. 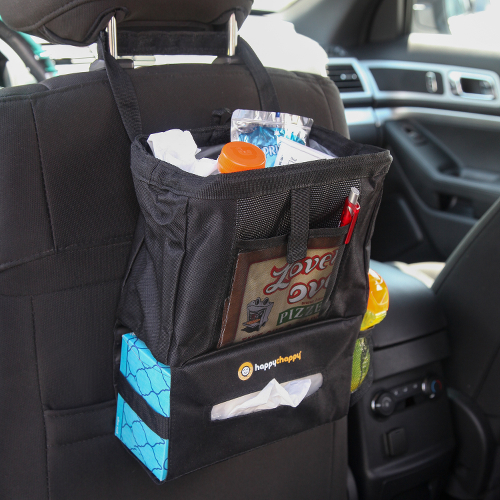 As with all products made by Picnic at Ascot, this is a formidably tough organizer for your vehicle. Crafted with hard wearing 600 denier polyester canvas, and sturdy sewn inside supports, this product will now sag like many lesser quality versions do. Three roomy compartments and two strategically placed side pockets allow for ample storage, and the removable high-density foam and heat welded cooler is perfect for transporting your drinks and packed lunches from your car to your picnic spot. The cooler is leak proof and keeps temperatures stable for hours. 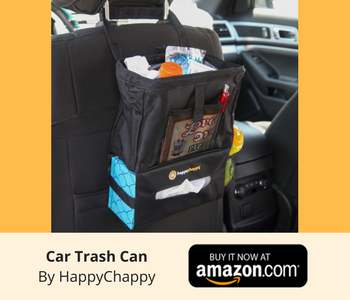 Comfortable handles make transporting the entire organizer easy, and this product will fit all makes of SUV’s, vans, trucks, and cars. 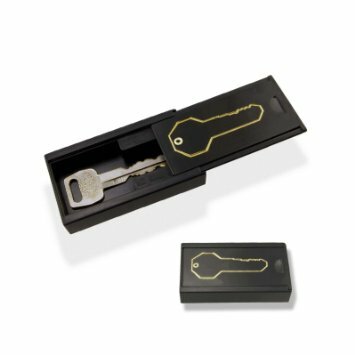 It also has a delightfully appealing design, so will perk up the look of any trunk, and comes with a lifetime warranty. If you have a bustling household full of hyperactive, sports-loving kids, then this is a must-have for you! 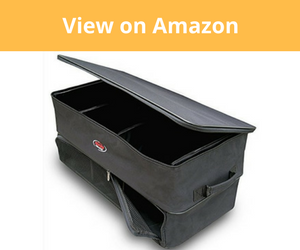 This tremendously tough Trunk Organizer provides ample storage space, which means you will be in no way limited when deciding on exactly how to organize your car trunk. 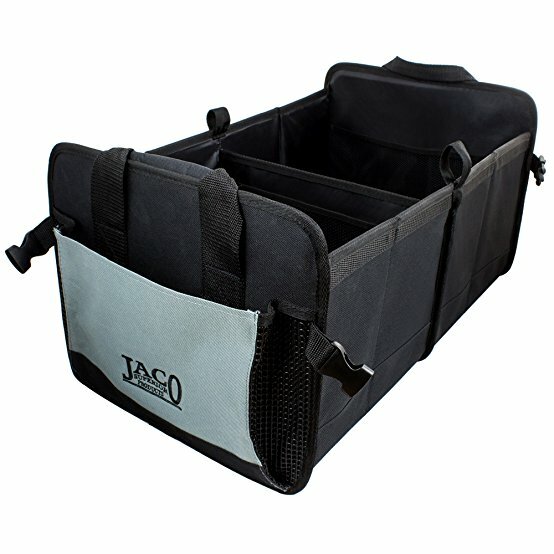 Constructed from Heavy Duty canvas and remarkably rigid interior dividers, finished off with unique “Easy-Pull” oversized zippers that effortlessly glide around the compartments, this product can withstand the battering that comes with transporting a wide variety of sporting equipment on a daily basis. 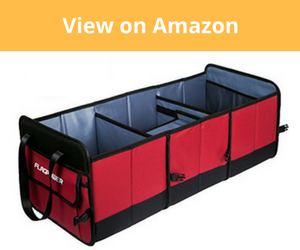 The robustly reinforced handles on either side of the organizer make it extremely easy to transport. 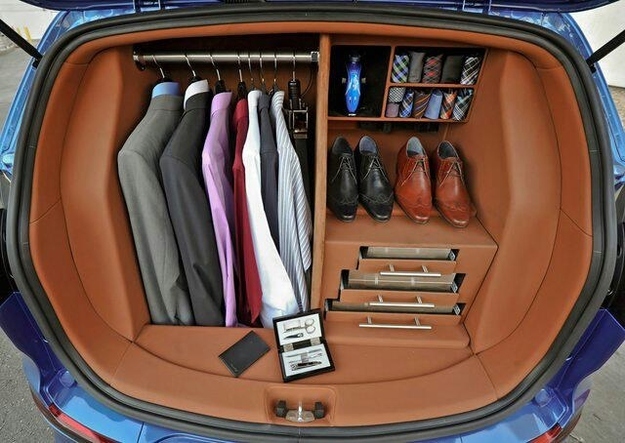 It also has three unique shoe cabinets underneath to store away those dirty shoes before the kids climb in the car. And thankfully they have mesh front panels to allow for ventilation. The last thing you want is for your beloved car to smell like used shoes. Ordering yourself a somewhat decent Trunk Organizer to assist you with restoring some semblance of order to your vehicle doesn’t have to break the bank. 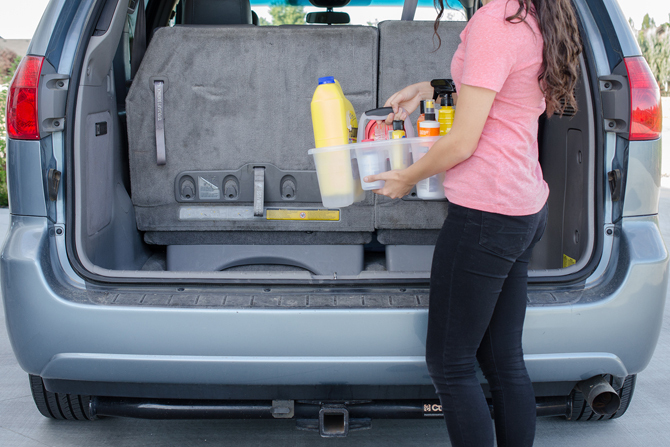 This attractively priced product form MaidMAX can hold up to 30lbs comfortably, and it has two spacious main compartments that will hold just about anything you find laying around your car. It has surprisingly sturdy side walls for a product at this price, and its rigid center divider helps it retain its shape even while empty. 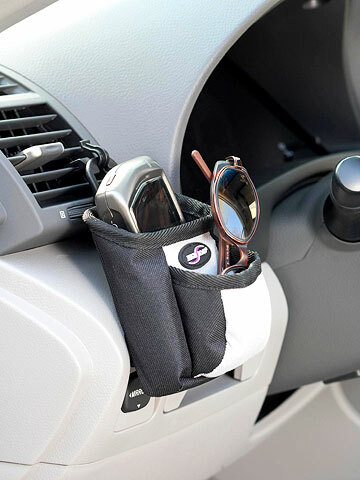 It also has two useful mesh side pockets to hold smaller items like maps or other car accessories. 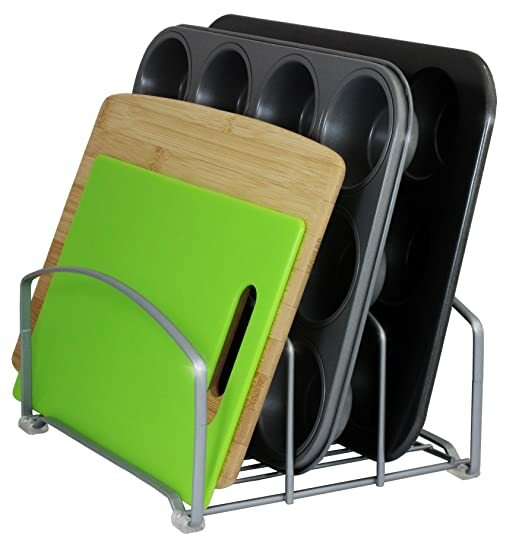 The sturdy handles on either end make lifting and carrying an easy exercise, and it collapses to allow for easy storage when not needed. 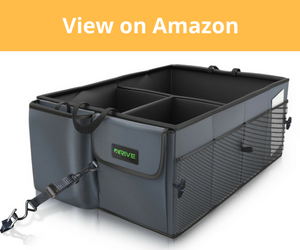 Made from premium cardboard, Tetoron and nylon mesh, this Organizer may be cheaper than its competitors, but it still delivers a top-quality, durable product that will not disappoint you. 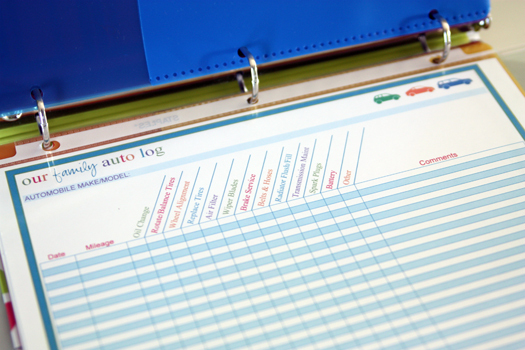 We all know how difficult it can be to stay tidy and organized in our busy day-to-day lives. It sometimes feels like there isn’t enough time to breath, let alone spend precious moments looking for misplaced sunglasses, cell phone chargers, wet wipes or the inevitable favorite plush toy. 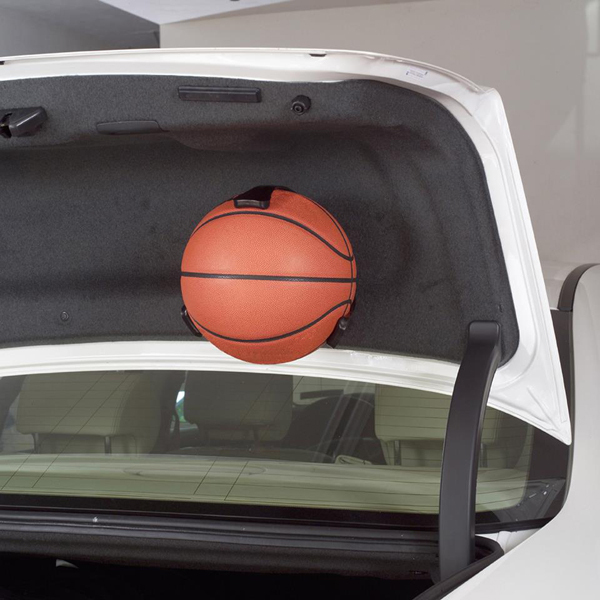 Enter your new best friend – the trunk organizer! With so many modern inventions claiming to make your life easier, but usually failing at this task, it is refreshing to find a simple, easy product that truly delivers on this promise. There seems to be an enormously wide variety of trunk organizers available, so choosing the best trunk organizer perfectly suited to your own personal needs can seem a little overwhelming. To make things a little less complicated for you, we have compiled this clear and informative buyer’s guide to assist you in finding the best trunk organizer for you and your family. 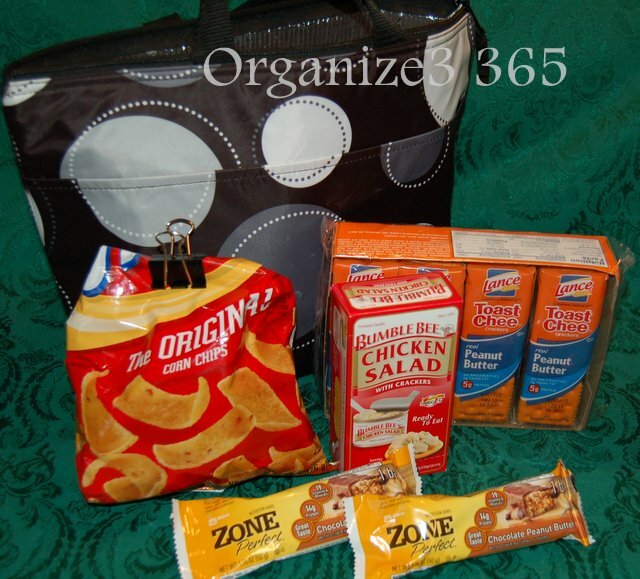 What Is a Trunk Organizer? A trunk organizer is a fantastic storage solution, made from a variety of hard-wearing materials, and features a variety of designs that include different storage pockets and compartments to help you separate and store your possessions. 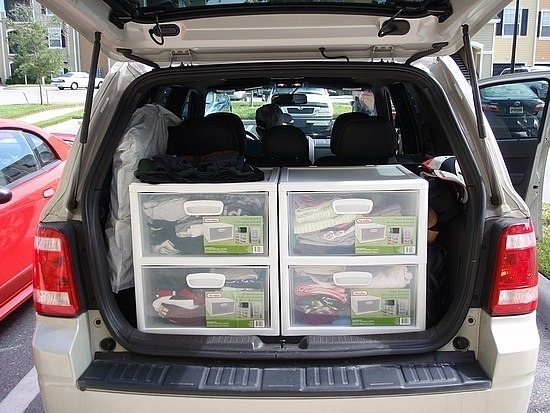 Most good quality trunk organizers are collapsible or foldable, allowing you to easily store them away when not in use – giving you the option of open trunk space for larger items when needed. They often have sturdy carry handles to allow for easy carrying to and from your vehicle, and certain brands provide additional features like coolers or shoe compartments. 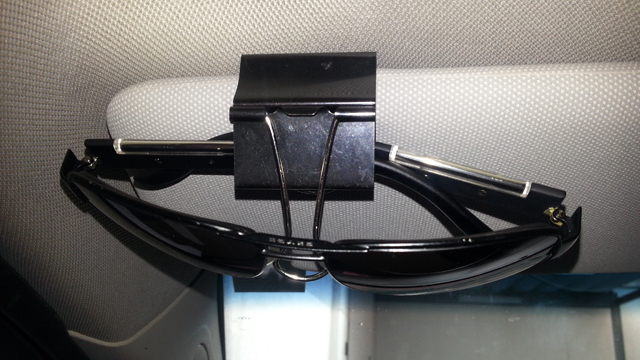 The intended use of these trunk organizers demands they can withstand heavy use. This means they are made from strong, durable materials like polyester and rubber. 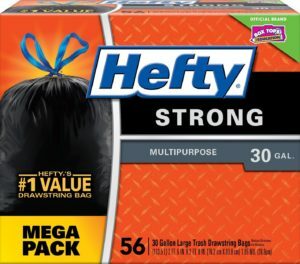 The heavy-duty variety is generally a bit more expensive, but often have reinforced stitching, and come with a lifetime warranty. When shopping around it is best to look out for materials that are waterproof, scuff resistant, and easy to clean. What Size Trunk Organizer Do I Need? Most Trunk Organizers are very similar in size, but it is a good idea to identify if your intended use will require slightly higher sides or bigger storage space overall. The biggest difference between these products is probably the size of the main storage compartments. Some have adjustable sub-dividers that allow you a certain amount of control over the size of the main compartments. 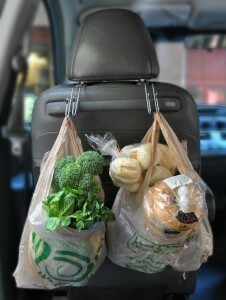 Certain designs allow for the product to be reduced to half size and used as a passenger seat organizer, which is fantastic if you spend a lot of time in your vehicle and need quick access to your phone, computer, or documents. 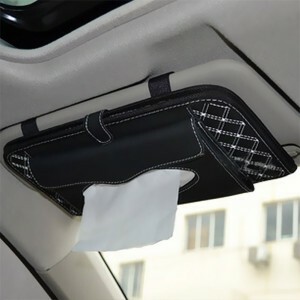 It is good to take notice of the fastening systems offered with this kind of product because if it cannot be safely secured to your front seat you might witness your belongings flung in every direction if you happen to come to an abrupt stop on your travels. The vast majority of these require no real installation, which is fantastic. 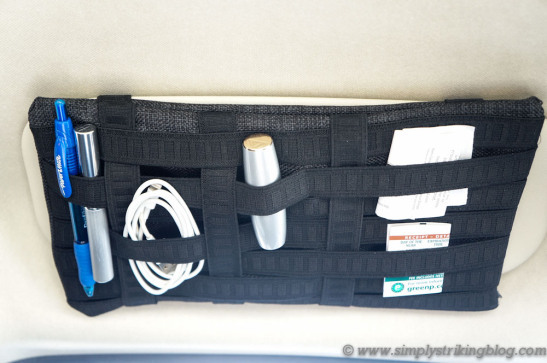 Trunk organizers will generally have either Velcro or rubber strips underneath to help keep the trunk organizer securely in place when you are driving. 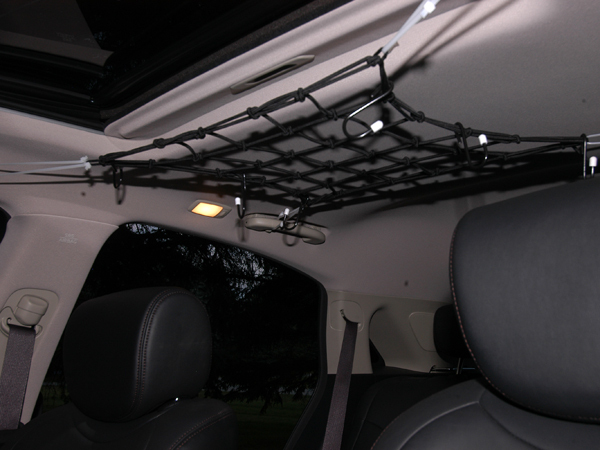 Alternatively, they will come with tie down straps to allow you to hook it onto different parts of your vehicle to keep it in place. Most modern vehicles now have places to hook such locking systems to, often small metal rings securely fastened to the floor of your trunk. 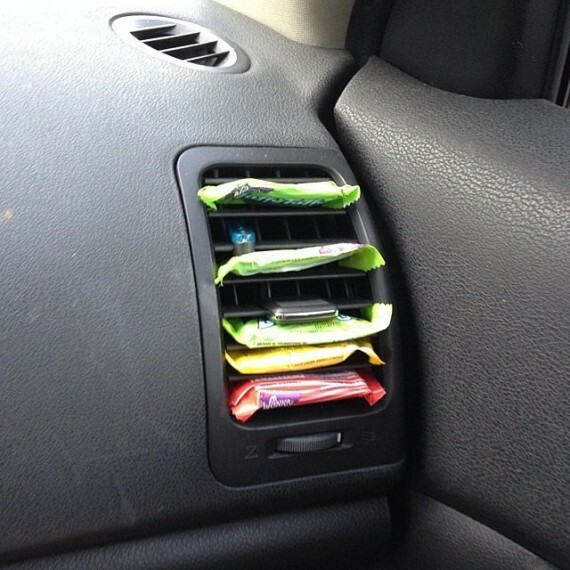 In conclusion, I can safely say you will not find a better storage solution for your vehicle organizational requirements. 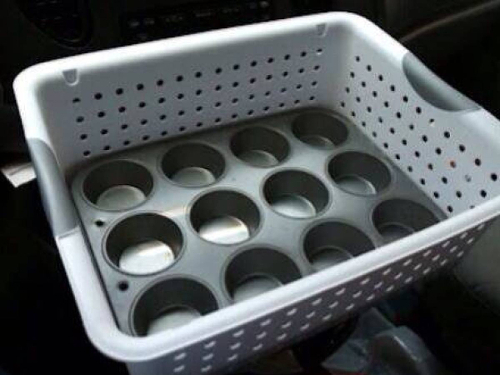 You will be pleasantly surprised at how quickly your vehicle will become decluttered, and how easy it will be to keep it that way once you bring one of these brilliant organizers into your trunk. So if you haven’t already stopped reading this article to rush off and order your very own Trunk Organizer online, I suggest you do so now! When it comes time to organize your closet, it can be slightly overwhelming. However, if you follow a systematic approach (like I describe in this guide), the investment will pay off by halving your total time to get things organized, restoring order and providing practicality from this day and beyond. The process of decluttering and organizing your closet can be complicated, but it doesn’t have to be! If you follow our step-by-step guide below you will see that there are some specific steps you can take to complete this task with minimum hassle. Below, we go through the main items that you will need to start the job. Then you can gather these items and start to work. There are a few things you will need to initiate the process of closet organization. All of these items are important, and it’s always best to gather all of the items that you will need before you start on your closet project of decluttering. That way, you won’t waste time going back and forth to secure the items while you are working on your closet. You may need a few other items, depending on your goal in organizing your closets. 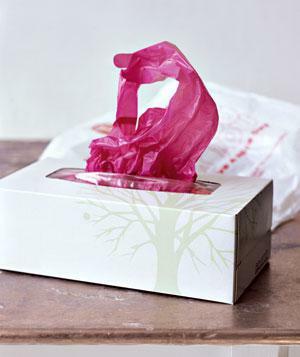 You will use the trash bags to throw away the stuff that you no longer need. 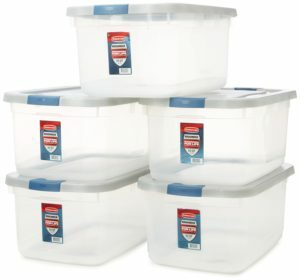 You’ll need storage containers too to free up floor space in your closet so that you’ll have more room. 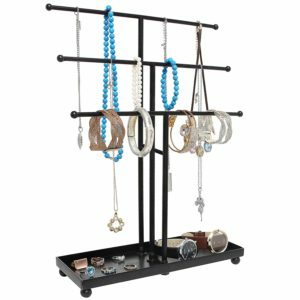 Using shoe and jewelry organizers are a great way to free up even more space by allowing you to place them into a hanging organizer for jewelry and using a shoe organizer to house your shoes in a way that allows them to be displayed. Not everyone wants to do it this way, but it is a viable option in organizing your items when planning to declutter your closets. One of the most important things you must do to organize your closet is to eliminate everything from your closet. 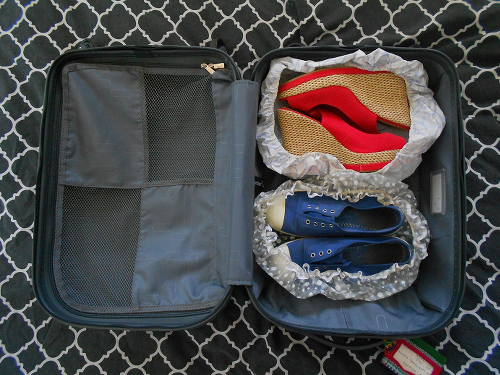 This includes all clothes, belts, purses and bags, shoes, and even luggage. This allows you to see everything that you have so that you can start sorting through the various items to see what is worth keeping and what should be given away. Some people try to organize by just moving things around but this often just serves to confuse you more as to what you should keep and what you should store or give away. Once you have everything removed from your closet where you can see everything, the real fun starts! Now you must decide which items you should keep and which ones you should get rid of. But how do you do this? You need criteria to decide which ones you keep and which you discard. The “keep pile” should be composed only of things that you want to keep and that you use regularly. One rule of thumb when cleaning out closets is to consider how often you wear an item. Some design and clutter experts say that if you cannot remember wearing the item within the past year, you should discard it. Some people have a problem with that because they want to keep things that they think are valuable to them. But the criteria they use for defining that value are related to factors that have nothing to do with real value. They may be sentimental about an item because it reminds them a special event or someone they love may have given it to them. They may also find value in something due to the fact that it is made of some sort of fine fabric such as velvet, silk, or satin but it has no real value since they rarely wear it. If you do not use a clothing item on a semi-regular basis, they are really just taking up space. When cleaning up the clutter from your closet, you have to also work on a “store pile.” Storage can be either short-term or long-term storage. For example, you may want to store some winter items during the summer months so that they are not taking up space in your closet. Winter clothes are inherently bulky and include sweaters, coats, and bulky fabrics and materials such as corduroy and wool, to name a few. Buy some long, clear plastic containers that will easily slide under your bed for this purpose. Once you get these Winter clothing items out of the way, you will free up a great deal of room for your normal season clothing items. An alternative to this is to use a second bedroom closer (if available) for storing your Winter clothes. If you do this, there will be no need to store these items under the bed. Instead, just have one closet dedicated to your Winter wardrobe and go to the closet when you need to access one of the clothing items. 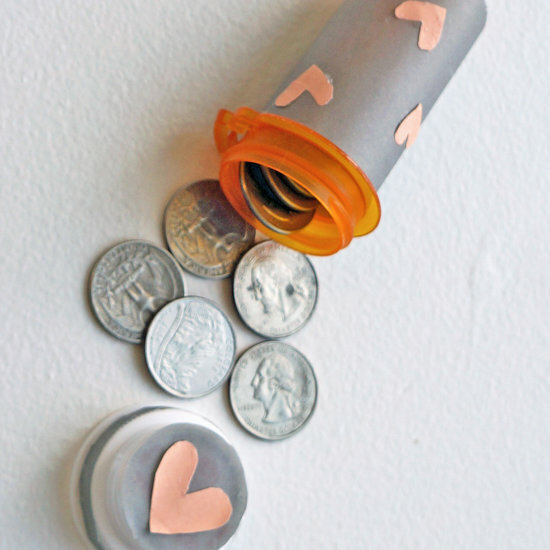 A donation pile is important because you need to separate those items that are good enough to be shared with charitable organizations from those that you should throw away. 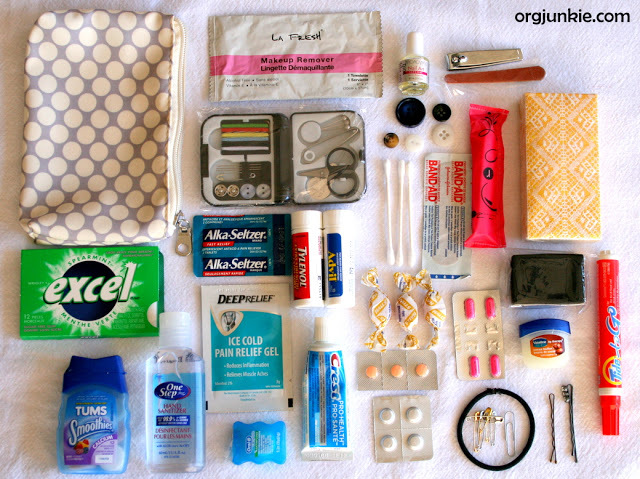 To avoid waste, you should never totally throw anything that is usable away. Instead, decide which items can be donated and put them in the donation pile then choose which charity you want to donate to and take them or mail them to their headquarters or pickup office. (See givebackbox.com) for an example of charitable organizations that allow you to send your items to them for donation. Once you have designated certain items for the donation pile and you have decided which items can be salvaged and given to charitable organizations, you are left with the trash pile. These are unusable items or items that are not of any real value. This can include clothes that no longer fit but are not in good enough shape to send to charities, clothing that cannot be repaired, older shoes and accessories that have missing buttons, zippers, or other items, and so forth. When you clear out the mess, you help clear the chaos and all you will be left with are important, most loved items that you value for your lifestyle and your wardrobe needs. Try to create a system that will work for you, not only when you are organizing but on a daily basis. That way, you will not run the risk of it ending up in the same shape that it was before. Remember that, even though you may think something is of some value, doesn’t mean that is really is. There is a big difference between real and perceived value. Advertisers will tell you that perceived value is of much greater impact than real value. Perceived value is any value that is believed to exist in the minds of a consumer or individual. Again, remember the “sentimental criteria” or other ideas that we often use to decide is something is of value. Be careful not to decide to hang onto an item simply because of this reason. Instead, try to remain intellectual and practical about it. The purpose is to declutter and organize your closet so this means letting go of any preconceived notions that are not reality-based statements about the items you are trying to organize. One way you can decide whether to keep things is to think about its level of functionality and practical use. If you can use an item because you can mix and match it with some of your best career outfits, for example, you should keep it because it has real value for you. If you do not wear it and it does not serve a viable purpose, you should discard it or give it to someone who will give it some good use. Once you have created these four piles and organized your closet items according to the action you plan to take on it, you should use this time to clean and tidy up before proceeding to the next step. One of the dustiest areas of your house is in your closet in the unused or undisturbed shelves. It can also attract spiders, so make sure and clear any cobwebs and spray shelves with a wood protector spray. Once you get your shelves decluttered and cleaned, you will be amazed at the way it brightens up your area. Then you can focus on freeing up space for your most loved items. The following video shows how to clean and organize your clothing area and it utilizes the same ideas that we have including in this post. You will notice that the narrator of this video has decided to fold most of her clothes items, rather than hanging them up. This system works for her since most of her clothes are casual wear. She also illustrates one way that you can sort out and organize your shoe collection using a shoe rack. Once you have cleaned and organized and you have taken everything out of your closet, you will want to decide how you are going to choose to organize them. Below are some of the ways you can organize your clothes in your closet. You should feel free to choose the method that works best for you, based on your own personal needs and tastes. Alejandra (below) has some great recommendations on how to organize your jewelry, shoes, scarves, and other times and place it in your closet using space dividers that you can purchase from any storage or organizational store. Regarding how you place clothes back in your closet, some people like to organized by season. If you do this, you may want to put the summer items first, such as tank tops and short-sleeved casual shirts followed by longer-sleeved items, then put in your less casual, dressy blouses or outfits. Remember as you go, you should have your four piles ready so that you can decide as you go which items will go with which pile. 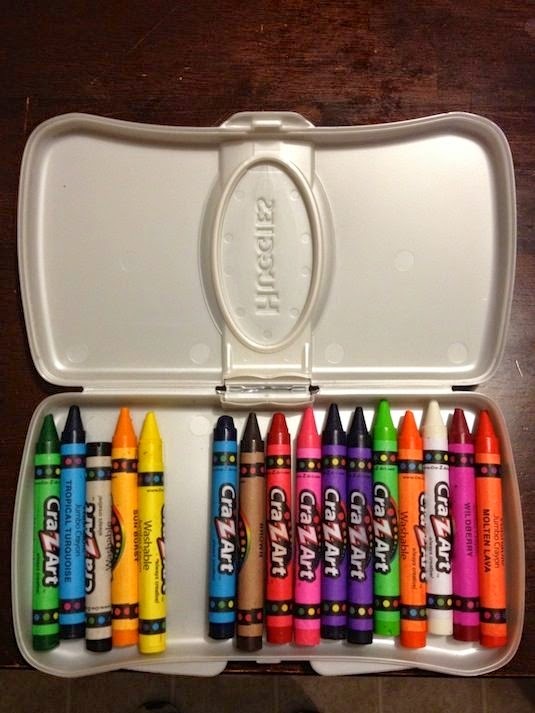 If you prefer to organize by color, you can do this instead. 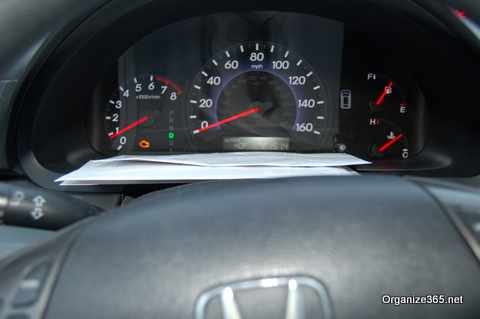 Some people like to do this because it makes it easier to locate things when you are in a hurry. This video shows how to organize according to color. Another way to organize your clothes is by type. You can organize them by the type of item they are such as vests, tank tops, sleeveless, or long-sleeved blouses, skirts, pants, and dresses. It doesn’t really matter how you create your closet system as long as it is practical and makes sense to you. Use your imagination and decide which type of organization method will work best for you with your own closet. Then go through our steps to reach your goals of decluttering and organizing your closet. Another neat way to organize your clothes is to organize according to how often you wear them. This will serve the additional purpose of monitoring how often you are wearing certain clothing items. Then you can decide which items are not getting enough wear and you can purge your closet of these items the next time you clean it out. There are several items that eat space in your closet. Some of these are listed below. Often it is the smaller items that cause the most trouble because they often take up space that could be used for many other larger things. By pulling out some of these items and designating a separate space for them, you will have much more space for the other things. Once you have organized your bedroom closet, you will also want to organize your coat closet or front closet. You can do this in any way that you choose as long as it provides a practical method of organization that can be done in a systematic method. You also want to figure out a method that you will use and that will be fairly easy to implement without a lot of thought. Once you figure that out, it just takes a little discipline to implement your system by reminding yourself to always hang up items according to your organizational system each time you change clothes. When hanging coats, you should also hang coats according to the frequency that you wear them so that you will be able to easily locate them when you are on the way out of the door. If you are ready to tackle your closet, empower yourself by reading this article again, taking notes on the things that resonate with you, and watch the videos we’ve included in this post. It may inspire you to create your own organizational ideas like Alejandra or our other closet organization experts that we have featured in this article. Remember that you can do it yourself if you just create a plan that will work. Look at your space and see what you have to work with. Then think about how you will organize. 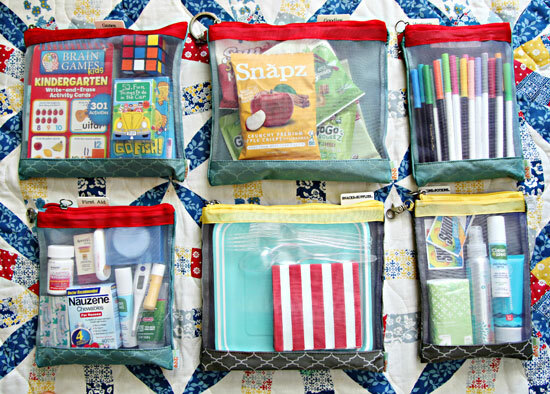 Will you organize by color, style, function, or other criteria? What criteria will you use to decide which clothing you will keep, discard, donate, or trash? These are all important questions to answer before you plod forward. Having a sense of your own priorities is important to your overall system of organization. Creating order out of chaos should be your ultimate goal. 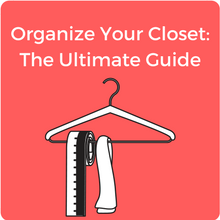 Here is an excellent infographic that you could print out and save to remind you of the important aspects of closet organization. You could apply this technique to any closet that you want to organize, whether your bedroom closet or front room closet. ire it done. It is really a contest between time or money. If you do it yourself, you will save money, but not time. If you hire it done, you’ll save money but not time. Which is most important to you? Some people really prefer to do it themselves because it allows you to maintain control over your decluttering project and allows you time to think about what type of organization you want to do. If you hire a professional organizer, they are likely to have a specific idea as to how they want to do it, whether it aligns with your own ideas or not. If you have any areas of your home that you wish to declutter, here is another resource that you may benefit from. It’s an eBook entitled, “10-Minute Declutter: The Stress-free Habit for Simplifying Your Home.” If you combine the resources and tips in this audiobook by S. J. Scott and Barrie Davenport for decluttering your home with the tips and tricks for closet decluttering that we have provided to you in this post, you may find that your house (including your closet) will be freed from clutter and chaos in no time at all. Now that we have presented some of our best ideas from our top resources on how to declutter and organize your closet, think about your own ideas. Have we missed anything? Is there anything you would have liked for us to have included in this post that would help you to organize your closet in a more practical manner? If so, feel free to contact us and who knows; we might even feature your tip or idea in a future post. Organization is never easy. The important thing is to think about your own lifestyle and consider what works best for you. Then start weeding out your closet. 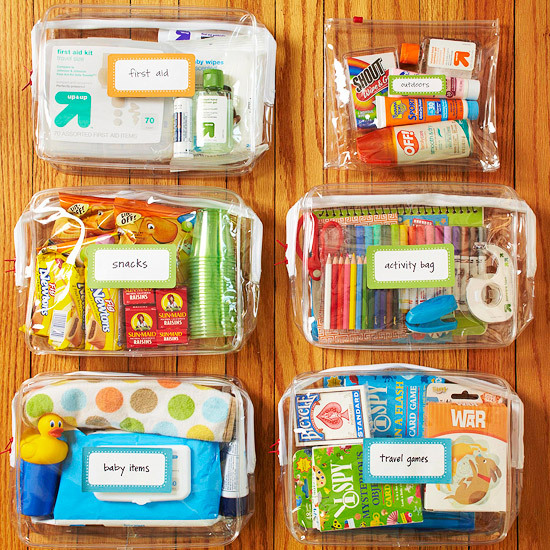 Your life will be much simpler and organized and you’ll be glad you took the time to do it!